I made a nice little batch of peach jam this afternoon using local peaches from Georgia. 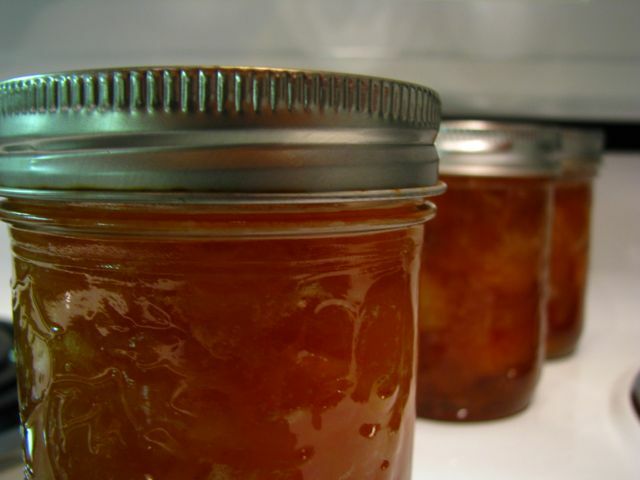 The simple recipe on the PickYourOwn website I followed has an enormous amount of helpful information beyond the ingredients and steps to follow: it includes photos for every step, frequently asked questions, recipe variations, additional information on canning equipment, and more. I’ve used that site for many other jams in the past and usually find success. Nonetheless, I find myself identifying areas for improvement in my jam every time. This time, I encountered a jam that was runny. Not having extra pectin in the house, and knowing I had to leave the house soon for a concert, I decided to simply take note in a Trello board that next time: buy an extra box of pectin, just in case. I’ve been working on a board on Trello that lists the steps I use to prepare and create jam which includes the little things I’ve learned along the way. Just like anything else, there are a few tricks that can be picked up along the way after a few attempts. A few jars of Georgia peach jam that I made one Sunday afternoon. This entry was posted in Cooking, Hobbies and tagged Georgia, georgia peach, homemade, jam, local, local food, Sunday, trello. Bookmark the permalink.